It was 1994, and Pete Coors had an idea. The head of the Golden, Colorado-based Adolph Coors Co., which his great-grandfather started, had noticed the rise in the number of smaller breweries and their brands nationwide. Why not get in on the action? Coors was, after all, the first brewery to use the Cascade aroma hop commercially; it had also created George Killian’s Red lager years before, boosting a style virtually nonexistent outside of Europe. The best way forward now, in Pete Coors’ mind, was with a specialty unit within the firm, one dedicated to coming up with recipes and brands that could then be sold to the same consumers going in for the likes of Samuel Adams Boston Lager and Pete’s Wicked Ale. As it turned out, a Coors employee named Keith Villa had recently returned from Brussels, where he earned a PhD in brewing science. 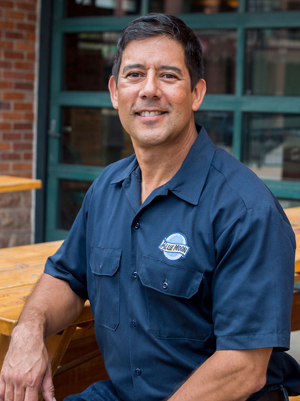 Villa had joined Coors straight out of the University of Colorado at Boulder after earning his degree in molecular biology (he was born near the main Coors brewery, in fact). Villa had intended to go to medical school, had even taken the exams and done the interviews, when he decided instead to give Coors a shot for a year and see how it turned out. Here’s how it turned out. Coors’ leadership charged Villa with coming up with the new beers from this newly formed specialty unit. More than that, he was in charge of setting up the brewery that would power the specialty unit. By this time 20 years ago, Villa was doing just that, creating a 10-barrel brewhouse for what came to be called the Blue Moon Brewing Co. behind the right-field stands at Coors Field, the Denver home of Major League Baseball’s Colorado Rockies. The idea was to test Blue Moon’s creations on the fans in the stands, making the brewery a de facto brewpub. In the fall of 1995, Blue Moon was ready to move beyond the ballpark with its first commercial release, Blue Moon Belgian White. It was a cloudy, citrusy, almost sweet spin on the wheat beers Villa had encountered during his studies in Belgium; and it helped immensely to popularize the style in the U.S.
Powered by Coors’ distribution muscle, soft-blue six-packs of the beer showed up virtually overnight at retailers in 22 states. Blue Moon contracted much of the beer then to be brewed at the F.X. Matt Brewing Co. in Utica, New York, though it eventually would come under Coors’ Tenth & Blake Beer Co. (and Coors, of course, would become MillerCoors). A marketing campaign accompanied the Blue Moon Belgian White rollout 20 years ago. Its tagline? “Handcrafted once in a blue moon.” It was an obvious nod to the beer’s, and the brewpub’s, name—and to the inspiration for those names—but also a nod to the fact that Blue Moon even existed. Larger operations such as Coors simply did not play in the smaller-scale sandbox of what were then widely known as microbreweries. Tellingly, the larger brewery’s name did not—and does not—appear on Blue Moon’s packaging, a fact that has rankled some smaller brewers, not to mention the Brewers Association trade group, which damned the omission as a stealthy marketing trick. Get excited they did, though. Blue Moon Belgian White by itself became one of the 20 biggest-selling beer brands—microbrew or otherwise—in the U.S. Its success prompted Coors to eventually expand the Blue Moon line into other styles; and, in early April, the company announced it would build another Blue Moon brewery in Denver. Like with the first one, its technical specs are up to Villa, who now travels the world evangelizing about the homerun he crafted out of the Rockies’ right field. The words “malty” or “malt” appear three times in Robertson’s 33 word review and he never mentions hop character or anything to do with hops, however I’d guess the review was written some years after the beer first appeared and the Cascade character probably lifted off. In contrast, his reviews (same part of the book) for the annual Anchor Our Special Ales of ’78-’81 all refer to a strong hop character or a “fruity” or “lychee” character which I believe is the Cascade. These beers are described as orange or orange-gold and I believe form a closer link to the Anchor Liberty Ale which became a regular production item from (IIRC) 1983. But apparently Cascade was first used in an appreciable quantity for aroma in that first Liberty Ale, I’m not disagreeing with that but adding these other points as clarifications I believe useful and accurate. It would be interesting, finally, to pin down when Henry Weinhard’s Private Reserve from Blitz-Weinhard first appeared since it advertised a prominent hop character and employed the Cascade. I believe it was after the issuance of that first Liberty Ale although I’ve never seen a date for it. Certainly the Weinhard had a good influence on the craft use of the hop although ironically it was – or rather is, I believe it is still made – a lager.